Last year it was bruited about that Terence Malick was shooting his new film wholly or partially in 65mm and distributor New Line Cinema was checking into whether there were enough theaters to do a limited 70mm release. 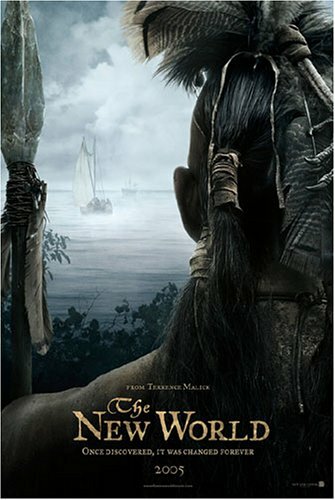 Although "The New World" is opening next month (25 December 2005), I've heard nothing about 65/70mm in relation to it. Is there a story here? According to the cinematographer, Emmanuel "Chivo" Lubezki, he and Malick briefly toyed with the idea of shooting the film in 65mm, but ultimately opted for anamorphic 35. Apparently, they only used 65mm for a few brief segments. Here's a preview of a direct quote from Chivo on the matter: "Our initial dream was to shoot the entire movie in 65mm, but there were so many barriers", says Lubezki. "The only person who really supported us in that idea was Vittorio Storaro [ASC, AIC]", who had mixed 65mm and 35mm on Little Buddha. "I called him to talk it over, and he said, Chivo, don´t even think about it. Shoot it all in 65!" But there are big problems with how to distribute 65 and postproduce sound for it. No one projects it any more." The filmmakers did shoot a small amount of 65mm "for what we called Hyper-enhanced moments" when, for example, John Smith or Pocahontas has an important realization." New Line does its domestic printing on Fuji stock, which I don't believe makes 70mm. It looks like Terrence Malick's "The New World" isn't going out with 70mm prints, at least here in L.A. Just plain 35mm and digital sound at the ArcLight and AMC Century 15 (in underwhelming SDDS). From what I understand, most of the film was shot in anamorphic, with a scene (or scenes) shot with John Smith and Pochantas in 65mm. I'm sure most of you have read the most recent issue of American Cinematographer featuring this film. There are some *interesting* quotes from the DP regarding 70mm. Too bad 70s weren't struck. If memory serves, this is the second time Malick has toyed with doing his film in 70mm. I believe that "The Thin Red Line" was supposedly considered for 65mm or at the very least, 70mm blow-ups. I don't have the particular issue of American Cinematographer in front of me to verify.